Now available in a 4-Ohm version, Traynor's top-selling TC410-4 delivers best-of-all-worlds performance for virtually any bass sound. Solid bottom end comes from four long excursion 10-inch drivers while crisp highs from the conical horn can be precisely control-regulated for any balance you prefer. This means the TC410 can cover any playing application. 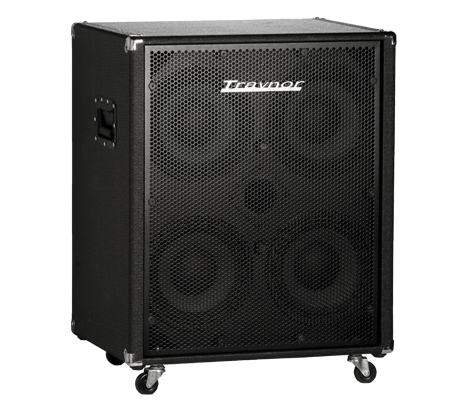 And for a wall-of-bass rig, dual TC410s provide a 2-piece, 1600-Watt 810 stack that can rock the roof. Or optionally the TC410 can be combined with a TC115 for a classic 4x10/1x15 stack. I had the 8 ohms version being driven by the Yorkville PX1700. I was getting good power but I found it was mudding up a bit when the bad got loud. I switched to the 4 ohm version and the power increased, my master went from 9 to 6 and it was just as loud, but clearer. I could dig in and it would mud up of get fuzzy, (unless I dialled that in) Very durable and heavy enough to feel like real gear.